A huge block, called the Stone of the Pregnant Woman, is considered to be the largest hewn stone in the world. Baalbeck is a city in eastern Lebanon famous chiefly for its magnificent, excellently preserved Roman temple ruins. It was a flourishing Phoenician town when the Greeks occupied it in 331 B.C. They renamed it "Heliopolis" (City of the Sun). It became a Roman colony under the Emperor Augustus in 16 B.C..On its acropolis, over the course of the next three centuries, the Romans constructed a monumental ensemble of three temples, three coutyards, and an enclosing wall built of some of the most gigantic stones ever crafted by man. Some tourists believe that the construction can only be attributed to extra-terrestial artwork. When Christianity was declared an official religion of the Roman Empire in 313 A.D., Byzantine Emperor Constantine officially closed the Baalbeck temples. At the end of the 4th century, the Emperor Theodosius tore down the altars of Jupiter's Great Court and built a basilica using the temple's stones and architectural elements. The remnants of the three apses of this basilica, originally oriented to the west, can still be seen in the upper part of the stairway of the Temple of Jupiter. Unfinished Obelisk. The granite quarries of ancient Aswan lay beside the Nile, thus providing easy access to boats for transporting this prized building stone to sites downstream. 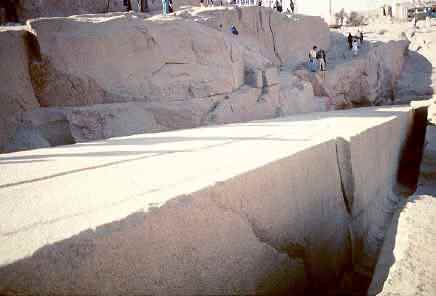 A crack in the granite stopped the cutting of what would have been an enormous obelisk (estimated at more than 40 meters high). Now the abandoned partially carved obelisk gives us information about how ancient stonecutters worked. Photo © 2001 Mary Ann Sullivan. At one time, the worldwide fame of the ruins at Baalbek drew huge numbers of tourist crowds. In the present day, a trip to Baalbek is extremely difficult and considerably dangerous. Luckily, the former curator of the site, Michel M. Alouf, made his years of research available in this heavily illustrated work. 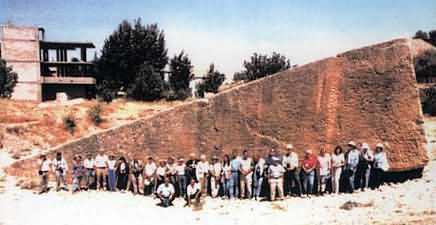 The massive multi-level platform found at Baalbek, is believed by some scientists to be one of the "only" prediluvial sites that survived the flood. At a much later time, it became very well known to the Romans, who desecrated the site to build their magnificent temples. 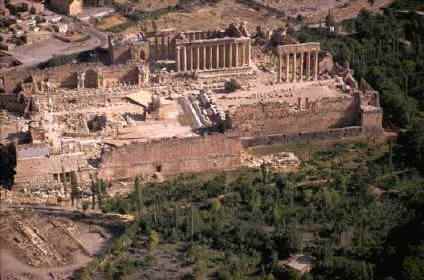 In fact, the largest Roman temples ever built were not in Rome, but were found at Baalbek. 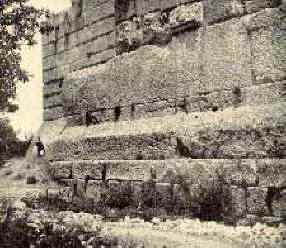 One of the most puzzling aspects of the ruins at Baalbek are the 1,000-plus ton stones which formed part of the original temple platform. A recent visit to the site allowed inspection of these large stones, and of the one at the quarry (pictured on the cover), where new measurements were taken which revealed the largest and most precisely cut stone at the Trilithon may weigh in at over 1,500 tons. The largest modern cranes in the world would have difficulty in lifting, let alone moving, these massive limestone blocks, and yet there they sit. These stones, and many other aspects of this important historical site are described at length in this handy reference guide. by Robert Bowie Johnson Jr. The DaVinci Code is Fiction. The Bible Code is Bogus. The Parthenon Code is True and Real, and It Tells the Story of Humanity's Origin. The Parthenon Code is a startling testament to the validity of Scripture. Greek Myth and Genesis tell the same story from opposite viewpoints. What is the Parthenon Code? The Parthenon Code is a simple method of expression devised by ancient Greek artists to communicate religious ideas and historical information to the everyday citizens of Greece. The messages were very simple and far less abstract than writing. We can compare them to other types of visual language such as stained-glass windows in the Medieval period, and even comic strip panels and story-boards for television in our own day. I call it the Parthenon Code because it was on Athena’s temple that this artistic communication reached its highest, and in many ways, its most straightforward and simple form. The seven sculptural themes on the outside of the temple and Athena’s gold and ivory idol-image on the inside portrayed interconnected truths about Greek origins. These historical and religious truths all appeared in similar ways on vase-paintings or on other temple sculptures, or on both. Greek artists went to great pains to tell us who they were and where they came from. It’s time we took them seriously. “Where does Greek myth come from?” By the grace of God, we have answered her question. We know now that Greek myth is the true story of the origins of the human race, a story told from a rebellious religious orientation that leaves out the Creator of heaven and earth, and shuns His prophets. And we’ve learned that the Parthenon sculptures were the Greek artists’ ultimate expression of the “myths” of Zeus-religion, and of man as the measure of all things. But “O, the depth of the riches and the wisdom and the knowledge of God! How inscrutable are His judgments, and untraceable His ways!” (Romans 11:33). What the Greeks meant to be an unparalleled, intricately chiseled monument to the glory of mankind turns out to be a detailed history of mankind’s delusion, and a clear-cut validation of the truth of the Word of God.